Content was freer and better. The only virality we had to worry about was Seth Godin, but his hucksterism was transparent enough. We need a return to independent platforms, with features designed, prototyped, developed, and spread by authors and editors, rather than by CEOs and marketers. Social Media is liberating, and has led to a magnificent proliferation of voices. But we're seeing a new age, as the major corporations behind the sites we've grown dependent on go public, and shareholders' needs begin to dominate those of authors and readers. Publishing on the Internet is still far from settled. We can still create the IndieWeb we all deserve. Evening of 2013.12.01. I'm thinking I should probably start a separate section of my site for these sorts of explorations. In honor of Vannevar Bush, perhaps I'll call it memex. "The three faces of City 2.0"
"New experiences like Songo also raise the question of individual freedom. In a city where everything is connected, the idea of ​​privacy is not it default setting?" With existing infrastructure like 4G phones, cctvs, pervasive netowrks, sensors, etc, "the city is, in fact, already digital"
"More than the threat of a widespread surveillance, then it is the collaborative practices that define the digital city." Rise of 'web 2.0' as a term: "Without major technical changes without central decision, a set of new tools (blogs, RSS son), new platforms (social networks, video sharing sites), new practices, both among providers and users, have transformed the place that the web plays in the lives of millions of people." "The people become "co-designers"." end the central monopoly on urban design and planning, involve more citizens in shaping their city. the technology enables, but is not primary. me: a quest for the technical perfection of public policy. requires perfect translation and implementation of these systems, in light of heclo's "iron triangle." in my metaphysics, perfect translation is unattainable. system would further be subject to imperfections magnified by absolutism pointed out in lessig's "code"
"We act in historical space and time, as do the technological systems we devise and enlist as our surrogates and extensions. " - how Latourian! "The Siemens scenario amounts to a bizarre compound assertion that each of our acts has a single salient meaning,"
" which is always and invariably straightforwardly self-evident — in fact, so much so that this meaning can be recognized, made sense of and acted upon remotely, by a machinic system, without any possibility of mistaken appraisal." "“the data is the data”: transcendent, limpid and uncompromised by human frailty. This mystification of “the data” goes ... unchallenged"
"the element of the arbitrary we see here should give us pause"
"the authorship of an algorithm intended to guide the distribution of civic resources is itself an inherently political act." "some easily-measured value used as a proxy for a reality that is harder to quantify, and again we see the distortion of ostensibly neutral results by the choices made by an algorithm’s designers"
"What is being suggested here strikes me as a rather profound misunderstanding of what a city is. Hierarchical organizations can be said to have goals, certainly, but not anything as heterogeneous in composition as a city, and most especially not a city in anything resembling a democratic society." Makes the claim "The modern city is the data city." "The data city of the future will be unnavigable without technology, granted..."
"cities as systems, reflecting the contemporary vogue for cybernetics and belief in automation." "Behaviour and information as the raw material to design cities with as much as steel, glass and concrete." "chaotic sprawls of the industrialising world such as the "maximum cities" of Mumbai or Guangzhou. Here the infrastructures are layered, ad-hoc, adaptive and personal"
"Cities are entities that network outside of nations as their wealth often exceeds that of the rest of the nation put together - it's natural they solve transnational, global problems." "The way the street feels may soon be defined by what cannot be seen with the naked eye." "Each element of data causes waves of responses in other connected databases, sometimes interacting with each other physically through proximity, other times through semantic connections across complex databases, sometimes in real-time, sometimes causing ripples months later. Some data is proprietary, enclosed and privately managed, some is open, collaborative and public." "So the more relevant question is how do the buildings and the rain of data interrelate?" "Considering the non-visual senses might be a better analogy when it comes to perceiving the way data affects i.e. looking at the way the street sounds, feels or smells." "Holes in data, public and private, may become more relevant than the pothole in the pavement - until you trip over it, at least." re availablility of services, "a sense of fragility in the network, perceived but not comprehended by users"
Two possible future streets: "Locked down street", "Open source street"
Generativity: " Proprietary systems, while ideally suited to high-security purposefully-closed networks, are intrinsically unlikely to enable a form of creative aggregation and connection unintended by the owners and makers." "Intrinsic local detail will tend to require collaborative updates from local users themselves." "An open approach to descriptive data can enable a far richer local dataset to emerge, more accurately conveying the sense of what the street is. It may also be patchy, however." Commercial efforts are likely to be poorly adapted for local needs. "This commercial development is a given, and often not related to those whose job it is to shape streets." "The various information modelling systems - the building information modelling system; those conveying the state of local services; those broadcasting the presence of a bus - could be built with openness in mind. Why do this? In order to enable maximum coverage and to stimulate engagement and innovation, with occasional possibility for unintended creative use. And often, it's public data and therefore part of a civic relationship." "Just as good street planning might leave a space open to possibility, and not over-prescribe its program, so informational systems can leave themselves open to possibility." "The patterns of use in their data become as self-evident as that shortcut worn through the grass in front of the library." "actually showing the seams of an object is far more likely to engender trust, engagement and appropriation." we are architects, historians, geographers. sociographers, demographers, planners. social workers, teachers, counselors. "As Reyner Banham said, when you’re running with technology, you’re in fast company - and you may have “discard the professional garments by which you are recognised”." I want to help build products which maximize freedom, agency, enlightenment, and well-being. Top-down approaches fail because the universe is made of atoms. Products which pander to passé procurement models are willfully negligent and ought to constitute developer malpractice. Programming in promises requires thinking about type signatures. People who have programmed in statically typed languages before are used to thinking about parameter types and return value types. For these people, it is easier to reason about a function from a URL to a Response object in terms of (URL) => Response rather than (URL, (Error, Response) => void) => void (using jsig notation). The former clearly expresses the expected input and output of the function, while the later only has input which is presumably being evaluated for its side effects. People who are used to programming in dynamic languages primarily aren't used to having to think in terms of types and signatures, so this additional overhead contributes to their perception of promises as being too hard, too mysterious, or too much to think about. Programmers used to thinking about types are already thinking about this, so this mental overhead is negligible, and the abstraction of promises makes code easier to reason about simply because it let's them reuse the abstractions, patterns, and mental models they're already used to. My relativistic assertion is that neither approach is correct, just as neither The British colour nor the American color is correct. This assertion is not without controversy, but neither are Promises. I appreciate the clarity that having type signatures gives me in communicating about code to fellow programmers (including my future self). Finally, I want to clear the air. There is an unfortunate amount of FUD on the side of some promise proponents, whom I've heard say things like "callbacks aren't composable". It is possible to do metaprogramming on callbacks, including things like control flow manipulation (parallelization), map/reduce, decorator pipelining, etc. It's just that this needs to be done either in an ad hoc way or using some purpose-built library like async (or any one of the dozens of other control flow libraries in npm). These are not always clear to reason about. I won't make any claims as to which is easier, but with promises, since they're just values, one can use the same value programming techniques like map and reduce that is typical in synchronous code. Aaron wasn't a victim of a cruel Department of Justice, unless we all are. His death is tragic, and this country (both our culture and our society) is terrible at dealing with mental illness. And the grossly disproportionate charges sought by his prosecution, and the prospect of facing more than 30 years in prison for his alleged and victimless crime no doubt caused great stress for a sensitive, idealistic, brilliant 26-year-old. But we should remember his work, and his message of openness, and take from it a renewed urgency to educate ourselves as citizens of a networked space. He was an activist, fighting at the vanguard of liberalism and freedom in our bold new networked age. He understood what was at stake in an interconnected world, how easy it is for individuals to be subsumed and left powerless by faceless, distributed, protocol-based power structures. As network citizens, we must treat ignorance and willful idiocy of networked power structures as no more acceptable than not knowing that there are 50 states, or that the Constitution was not signed in 1776, or that there are three branches of the American federal system. The network is the dominant power structure of our lifetimes, and it is incumbent upon us to be conversant in this new territory, to understand the stakes, the parties involved, the competing powered and monied interests, and to recognize that we still have legitimate popular sovereignty over these several corporate and special interests. Citizenship is a duty for any individual caught living in an advanced society. Be a citizen. Requiescat in pace, Aaron Swartz. 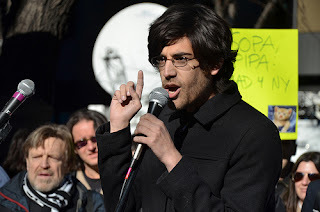 Aaron Swartz speaking at a PIPA/SOPA opposition rally in New York.